Now that Russia has successfully invaded the Crimea and is annexing it, what propaganda do we hear from "The Voice off Russia" here in Canada? According to them, Canadian authorities have committed an innocent man to a mental institution for being generous, and giving money to strangers. Of course I wanted to check this out. Is it true or is it propaganda? Or is it both? So I found out that this same story, with the same slant, is indeed being run on a lot of Canadian news outlets, such as Sun News and the National Post, and others. Here is what seems to have happened. A man was handing out 100 and 50 dollar bills to strangers in Halifax. Now that would not be crazy if Bill Gates was doing it, but I'm pretty sure if Mary Ann found out I was doing it, there would be some explaining to do. So, the police had reason to suspect this man was losing his marbles, which by the way, for all you police haters out there, it is not that uncommon for people to lose their marbles, either due to natural causes affecting the brain or due to drugs. At any rate, it is not "evil" for the police to question somebody who is causing a scene on a street corner, especially if he is attracting a crowd of greedy people who want in on the action. It seems after questioning Richard Wright, and finding out that his home was "in the woods" and that he was on a mission from God, and that one day the 1% richest people were going to have problems, they decided to take him to a nice warm place to get checked out by a trained professional psychiatrist. 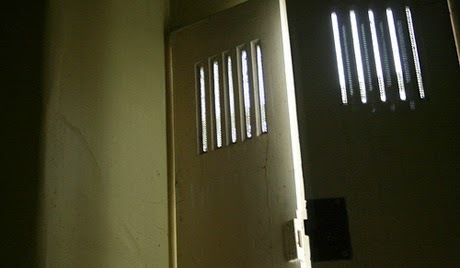 He was not locked in a dark cell with bars on the doors, as was implied in the picture (above) on the Russian website. That is a picture of a Russian mental health prison gulag, not a Canadian hospital. So you Canadians who are commenting that you hate the police and the psychiatrists, how would you feel if your spouse, or sibling, or parent suddenly decided to walk up and down the street handing out hundred dollar bills? I thought so. Get them checked out. This is Canada, not Russia. Last year, Olympic runner Oscar Pistorius was accused of murdering his girlfriend Reeva Steenkamp. The trial is going on right now in South Africa. What do you need to know about South Africa, to be able to follow this trial? Well, other than the fact that South Africa is mostly a black country with a white minority, it is recovering from a long period of time where the whites took charge and violently suppressed the black people. This was called "Apartheid". Today in South Africa, blacks are allowed to vote, and hold jobs that were previously reserved for whites (like President of the country, policeman, judge etc.) But the black people are still mostly poor, and now South Africa has one of the highest crime rates in the world, an overwhelmed police force and justice system, and also one of the highest crime rates of men against their women. Yet still, it functions as a country and tourists still visit there. Interesting, also that the judge in Oscar's case is black and a woman. Also, that Oscar has both legs amputated at the knee and runs competitively on springs known as blades. He fought a long battle to be allowed to run in the real Olympics, and won his case. But did not win a gold medal. Now back to the trial. Oscars's version of events: at 3:00AM one morning in Oscar's house, Oscar heard a sound in the bathroom. Thinking it was a burglar, Oscar grabbed his gun from under the pillow and fired four shots through the bathroom door. He was then very distressed to find out that his girlfriend, Reeva, was not in bed. He then broke down the locked bathroom door with a cricket bat, and saw her dead inside the toilet. Police Version: Oscar was trying to murder his girlfriend, and Oscar was trying to make it look like he didn't know she was in there so that he would not have to go to jail for murder. Also, Reeva was screaming in pain and fear as two of the first three bullets hit her, and the final bullet through the brain finished her off. Neighbours heard the screaming and gunshots, which Oscar's lawyer insists was Oscar screaming like a woman, and the sound of the cricket bat smashing the door open. The neighbours don't agree. My version: Both sides seem a bit extreme. For one thing, even if Oscar had killed an actual intruder (most likely a black man) instead of his white TV star girlfriend, he would still go to jail for 10 years according to South African law, for killing someone without a self-defence argument. On the other hand, Oscar's case is also very weak in that he seems to be a quick-tempered hothead who loves guns and the shooting thereof without any concern for other people's safety. He is also very wealthy, and I think (or am guessing) he felt like the law was mostly for other people. He also throws up a lot when he hears about the damage his "special" bullets did to his girlfriend. Most recently, in this trial, Oscar and Reeva's private phone texts have been introduced as evidence. Reeva once sent a message to Oscar saying he "scared" her sometimes. Oscar's tenacious lawyer argues that out of the thousand or so text messages, 99% were loving and kind. My question: Is it also a good defence to argue that 99% of the time that Reeva went to the bathroom, that Oscar did not kill her? Picture: From Oscar's twitter account, apparently of Oscar and Reeva at a party. I found it on this page. This may be an old question, but I only heard it recently. Is a person who owns a cat the same as a slave owner? I want to answer this question for two reasons. I did own a cat, and second, slavery is the argument that fuelled the trend to extreme Bible Literalism. I admit that I did not pay my cat any money for working for me. On the other hand, he did very little "work" other than scratching up the furniture and barfing in surprising places. So that is the end of the similarity of pet owning to slavery, now I will give my reasons for supporting pet ownership, even though I oppose slavery. Ironically, if all slaves were treated as well as the average pet cat, the institution of slavery might have survived till today. But no, slaves were not treated as well as my cat. Sad to say, human slaves were treated much worse than cat slaves. If my cat runs away, I don't send dogs after it to tear it to shreds, then whip it or cut its legs off when I get it back. Also, there is no law in the land that compels me to commit such barbaric acts to my cat. Au contraire, I would be punished for "cruelty to animals" for doing it. And there is no passage in the bible supporting such cruelty to cats. The problem with slavery was not so much about paying slaves proper salary. Slavery simply was an evil governmental institution that also spawned an evil religious cult. A cult that used the literal interpretation of the bible to justify such barbarity against fellow human beings, that today we would call it institutional terrorism. Fundamentalist religion made slave owners feel that any evil they did would be forgiven, because the Bible itself told them that slavery was performed with God's blessing. And the Bible could never be wrong. End of argument, but I still have more to say! It is unfortunate that even to this day we have people indoctrinated on this old-time religion from the Slave States/Bible Belt, putting forward the same old arguments that make no more sense today than they did before the Civil War. It's obvious to me that we must continue to argue about slavery with extreme Bible Believers. We cannot allow Bible Fundamentalists to sabotage the public education system by changing the topic from slavery to an argument about evolution and "Darwinism". Let's take the fundamentalist religious controversy back to slavery, where it started, instead of letting it spread its curse of ignorance to all aspects of our society. 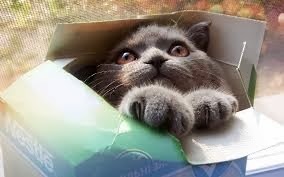 Picture: Kitten jammed in a tight box on a slave ship to America.